Fleece is a synthetic fabric made from 100 percent polyester. This fabric is different from other polyester fabrics in that the thread isn't long and smooth. Instead the fibers develop a wool like texture during the manufacturing process. 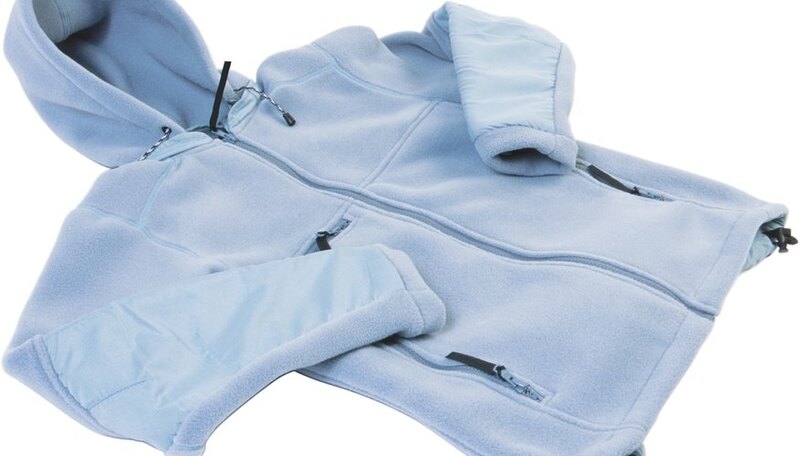 Several types of fleece are manufactured including high-quality polar fleece. This fleece is very thick and wears longer than other fleeces. However, all fleece is prone to shrinking in the wash.
Fleece is a soft, thick, plush polyester fabric used primarily in blankets, accessories, activewear, pajamas and baby diapers. Fleece is available in a wide variety of colors, patterns and with different dyed images on it, making fleece useful for almost any project. Fleece is stain-resistant and easy to wash. It dries quickly and is lightweight. Fleece is pill-resistant, although some lower quality fleece fabrics do pill will long-term use. Fleece is valued for its versatility as some types are designed to wick moisture away from the body, while others repel moisture. Fleece is available in several weights from 100 to 2000 weight and in various styles from the strong and widely available polar fleece to the medium-weight Berber fleece for lining. No matter the style, all fleece has the same basic care instructions to prevent shrinkage and maintain cleanliness. Wash the fleece in cold or lukewarm water and tumble dry on a low heat setting. Do not use bleach or fabric softener with fleece and do not dry clean or iron fleece. Turn a fleece garment inside out when washing for best results. Fleece is sometimes shrunk on purpose, either to prep it for a sewing project or to shrink a garment down a size. To shrink fleece, wash it separately from other laundry in the hottest water temperature setting possible. Dry the fleece on the hottest dryer setting possible. Take the fleece out and check it for size. If this is a garment, try it on to make sure it fits. If it needs to shrink further, run it through the process again. Fleece doesn't fray on the edges, making it useful for no-sew craft projects. Consider buying several panels of fleece and attempting a no-sew blanket. Do not stretch or pull on fleece as this will pull the fibers apart and ruin the fabric. If it does get stretched out, try the shrinking process above to see if the fabric is fixable. Don't try to shrink any fleece with a decal or a very bright pattern dyed on it. The process will ruin the decal and cause the pattern to bleed. SNV Plastics: How Is Fleece Made of Plastic Bottles?